A teenager from Southern California has designed a compact nuclear reactor capable of converting waste from old atomic weapons into power for homes and factories. Eighteen-year-old Taylor Wilson says his invention could maybe one day power space colonies. 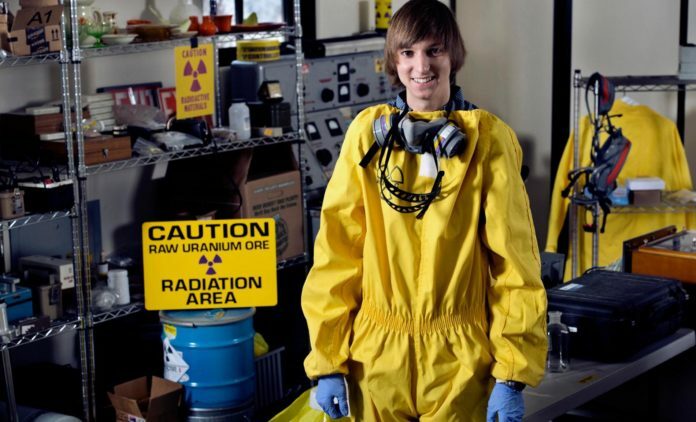 Digitaljournal.com reports: According to TED Blog, Wilson, who graduated from high school in May, first came to attention at the tender age of 14 after he designed a nuclear fission reactor he planned to build in his parents’ garage. He spoke about that at TED2012 and at TED2013 Conference in Southern California, he spoke about his latest project on Thursday. TED Blog reports that what Wilson has invented is a Small Modular Fission Reactor that can be built in factories and shipped to anywhere they are needed. The reactors are installed three meters underground which makes safer from the perspective of counter-terrorism than reactors built above the ground. They are also molten salt reactors, meaning, according to TED Blog, that they can run on the waste from old nuclear weapons and thus make it possible to find a way to use the material from weapon stockpiles, another safety issue from the counter-terrorism perspective. According to AFP, the reactor is capable of generating 50-100 megawatts of electricity, enough to power as many as 100,000 homes. Wilson explains that one of the problems with traditional nuclear power plants is that they need refueling after running for 18 months. But the young inventor’s Small Modular Fission Reactors can run for up to 30 years without need for refueling. The advantage from this is that they can be run as a closed system while they are in use, this being yet another safety feature. According to Wilson, after 30 years the reactors can be sealed up and discarded. According to AFP, Wilson’s reactors are designed to spin turbines using gas instead of steam. This means they can operate at temperatures lower than traditional nuclear reactors. Wilson plans to have a prototype of his reactors ready in two years. He told TED curator Chris Anderson that he hopes to have a marketable product in five years. Wilson said the prospects for his Small Modular Fission Reactors are exciting because they are environment-friendly and could help to combat climate change by providing carbon-free electricity for homes and businesses. He said the reactors also have great potentials to provide power for the developing world. Ecuador set to create state backed digital currency… to ditch dollar?